In today’s market, disruption of established business models lurks around every corner. That makes delivering a quality customer experience ― one that helps insulate a business from competitive threats and total disruption― bottom-line critical. As David Cooperstein, a digital marketing and strategy authority at Forrester, says, “The only sustainable competitive advantage is knowledge of and engagement with customers.” As your customers become more connected and empowered, and traditional sources of competitive dominance wane, a holistic approach to customer experience is mission critical. But how do you achieve this? I head up a Customer Experience Insights team for Wells Fargo Wholesale Banking – a group that serves big corporations, middle-market businesses, governments, and institutions with annual revenues of $20 million and more. Our Insights group is a hybrid of quantitative data analysts and qualitative design researchers. We integrate left- and right–brain approaches to provide insights into our customer’s goals, behaviors, and tasks. Yet we do more than churn out insights: We make our customers’ organizations more human by developing capabilities to thrive in a world exploding with change. These capabilities ― embracing a holistic mindset, creating shared understanding, and engaging in design-oriented problem solving ― are about seeing the whole, aligning the diverse perspectives, and visualizing the future. These elements are crucial to building human-centered organizations for today’s networked world. Most businesses have an industrial-era hangover ― a mechanistic mindset that breaks functions, departments, and processes down into smaller parts to control complexity and maximize efficiency. This approach works best in stable, routine, predictable environments. We are no longer living in that world. Organizations create positive customer experiences by aligning an organization’s strategy, technology, and execution process with customer expectations. A holistic mindset is critical to understanding both how things work and the underlying dynamics of why things work. 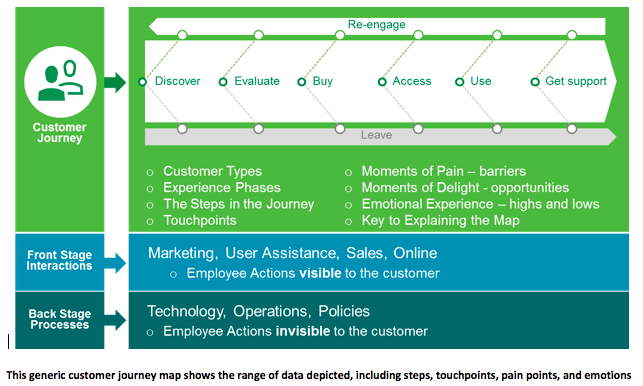 Customer journey mapping, as my Insights team calls it, illuminates the particulars of the experience – its steps, phases, touchpoints, pain points, moments of delight, emotional experience – and its scope beyond the moment when the product or service overlaps with the customer’s life. Based on a synthesis of what people do, say, and feel, these customer journey maps reveal that the total customer experience is more than the sum of individual processes strung together across departments. To differentiate on customer experience, organizations need both insight into the entire customer lifecycle and help connecting the dots between siloed organizational departments. Researchers tasked with mapping the customer’s journey find themselves leading organizational change just by bringing separate departments together to think about the end-to-end life cycle. Transformation to a holistic customer experience approach begins as the business reconciles its own internally held assumptions – embedded in its strategies, processes, and structure – with how customers experience results. What does it all add up to? What’s in and out of alignment with intentions? Where is friction in the system? Where are the opportunities? The nature of work today is multifunctional – it takes product managers, designers, technologists and others to bring digital products to market. These teams come together to execute simple solutions for customers amid complexity, and each function represents a diverse viewpoint and focus that must be discussed, understood, and reconciled for alignment and collaboration to occur. Customer insights are most powerful in helping organizations learn and innovate when the what of lived experience combines and calibrates with the how of meeting business goals. The power shift from business to people signals a need for organizations and their teams to transform how they work together and create value. User-centered design (UCD) is a product development process that supports customer centricity by incorporating iterative end-user feedback throughout the entire product life cycle. The rise of UCD practices acknowledges that products and services need to work well for people who use them. In an experience-driven economy, UCD mitigates risk of an unsuccessful product by getting noise out of the system earlier. Design-oriented problem–solving is about recognizing that the future can’t be proven in advance. The only way to get to a successful solution is to prototype, gather feedback from real people, and refine. To achieve Cooperstein’s vision sustainable competitive advantage ― knowledge of and engagement with customers ― companies must implement a holistic approach to customer experience. But this doesn’t just happen. It needs the customer’s voice to be heard companywide. That’s the role of Wells Fargo’s Customer Insights teams. As businesses, we can and should do so much more than collect data about people. We can catalyze our organizations to better understand the humans we serve, and in the process, make our businesses more human.